Exiled on a deserted island, a Christ-haunted journalist-turned-filmmaker attempts to persuade a married women from his past to help him produce a science fiction-themed pastiche to the 1960s French New Wave classic, Last Year at Marienbad. Through this act of artistic creation, he expects to carry out the will of God by prophesizing the death of time and the birth of a new religion. If only he can make the woman remember him. "Marienbad My Love," the world's longest novel, is being offered for the first time in print and Kindle formats. This multi-million-word, multi-volume work has been meticulously assembled through calculation and chance from fragments of pre-existing texts both written and appropriated by Mark Leach over the course of 30 years - "the movie," as Leach calls it, "of all my labors and all my inspirations." 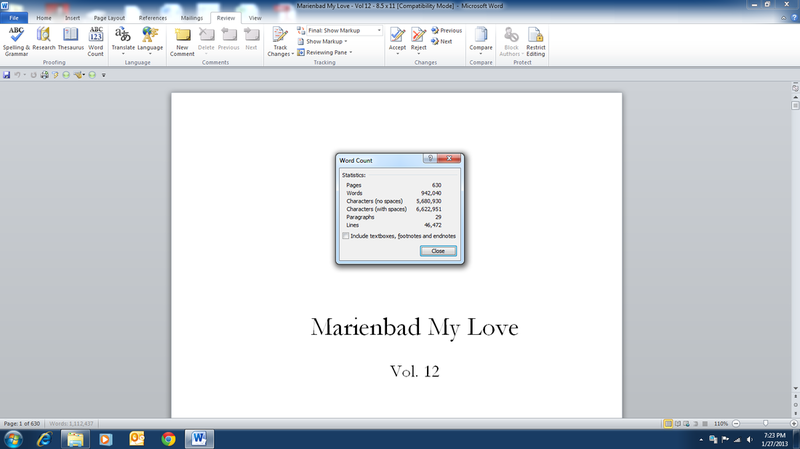 As of Feb. 1, 2013, "Marienbad My Love" consists of 17 volumes totaling 17.8 million words and 10,710 pages. 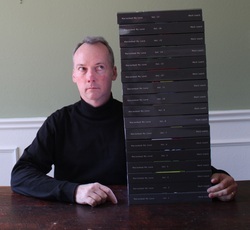 Welcome to the world's largest "open source" novel. The original 2008 edition of the novel is available for free download via the "DRIVE-IN" link. (NOTE: A revised 2013 edition is available for purchase in Kindle and print formats.) You are invited to copy, distribute and transmit this work, in whole or part. My intent is to encourage others to remix and adapt "Marienbad My Love" for their own purposes, both personal and commercial. To learn more about how you can make use of this free offer, click on the Creative Commons link below. author of "Marienbad My Love"
Mark Leach (1961, Waco, United States) is an artist who mainly works with contemporary strategies. By experimenting with aleatoric processes, Leach formalizes the coincidental and emphasizes the conscious process of composition that is behind the seemingly random works. The thought processes, which are supposedly private, highly subjective and unfiltered in their references to dream worlds, are frequently revealed as assemblages that explore new ideas in language ideologies, crowdsourcing and aggregate authorship. Leach creates situations in which everyday objects are altered or detached from their natural function. By applying specific combinations and certain manipulations, different functions and/or contexts are created. With the use of appropriated materials which are borrowed from a day-to-day context, he presents everyday objects as well as references to texts, painting and architecture. Pompous writings and Utopian constructivist designs are juxtaposed with trivial objects. Categories are subtly reversed. His works feature coincidental, accidental and unexpected connections which make it possible to revise art history and, even better, to complement it. Combining unrelated aspects lead to surprising analogies. These ideas are on display in a variety of works, including the 17-million-word "Marienbad My Love," the world's longest novel. His book "Cutting Up Two Burroughs" has garnered attention on the Poetry Foundation's Harriet news blog (http://www.poetryfoundation.org/harriet/2012/04/more-otherness-from-conceptual-literature/ ). Mark Leach currently lives and works in Texas. Thrill-crazed space bugs on a mission from God! government conspiracies and evil corporate cabals. the Clock in the Air has been "de-cloaked," there is no denying its existence. significant: A sign from the Deity. “Actung!” – in a decidedly Luftwaffe font. in glowing drawers of human-insect hybrid fetuses. new genetic code will transform us into new beings. And sure enough, I am right. my house. I picture its multi-gabled roof exploding in flames. Red Chamber by Cao Xueqin. Want to publish a novel but don’t have time to write? Mark Leach has a deal for you. transmission and remixing of the 17-million-word work. free and legal sharing, use, repurposing and remixing. novel that remixed snippets of other writers' texts into a new and unique work. 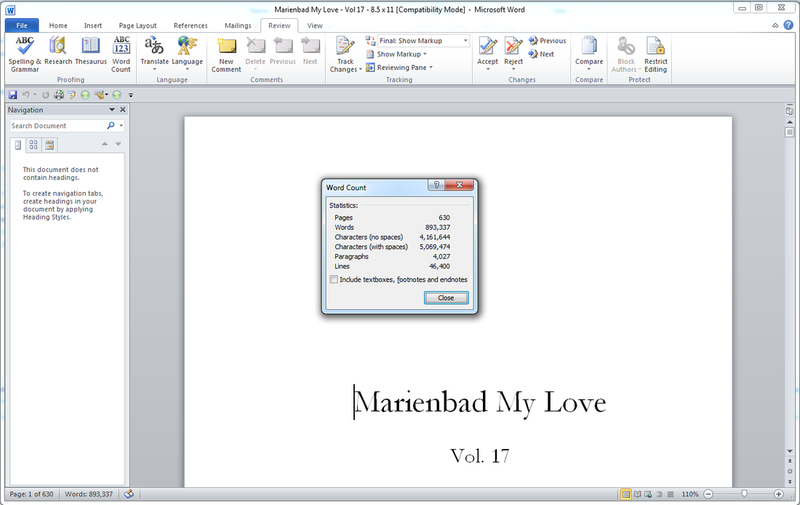 17 million words and counting! covered as a reporter at the Fort Worth Star-Telegram. like a piece of living history." the world's faiths and means "god within." 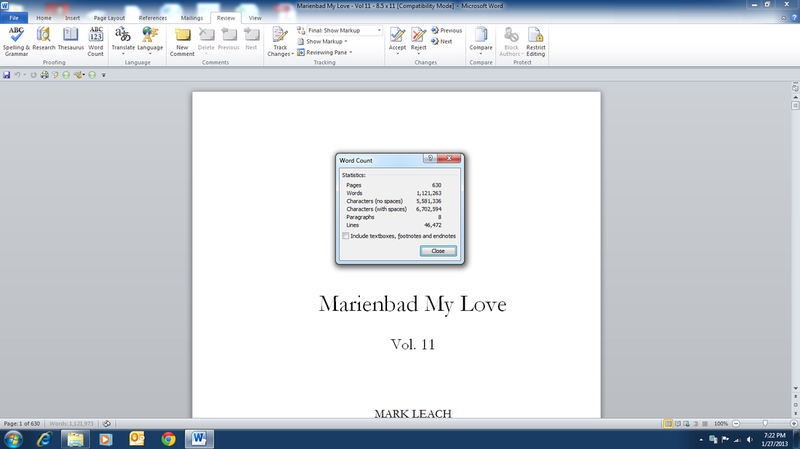 * longest book title (6,700 words)..
"Marienbad My Love" by Mark Leach contains 109,465,318 characters (each letter counts as one character. Spaces are also counted, as one character each). * the exact amount of characters (as well as the method used to derive the total) - "Marienbad My Love" is 109,465,318 characters (with spaces). Character counts were measured for each of the 17 volumes using Microsoft Word (one volume per Word document). The final count was produced in an Excel spread sheet. For verification purposes, screen shots of the 17 Word documents and Excel summary are pasted below. 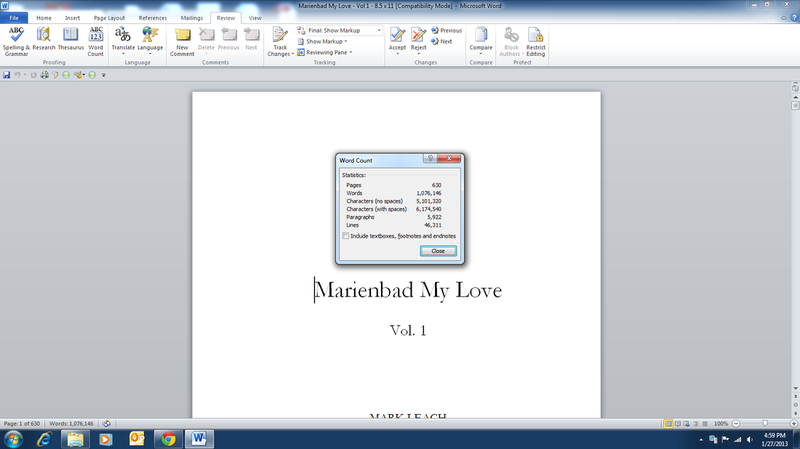 * the number of pages - "Marienbad My Love" is 10,710 pages. 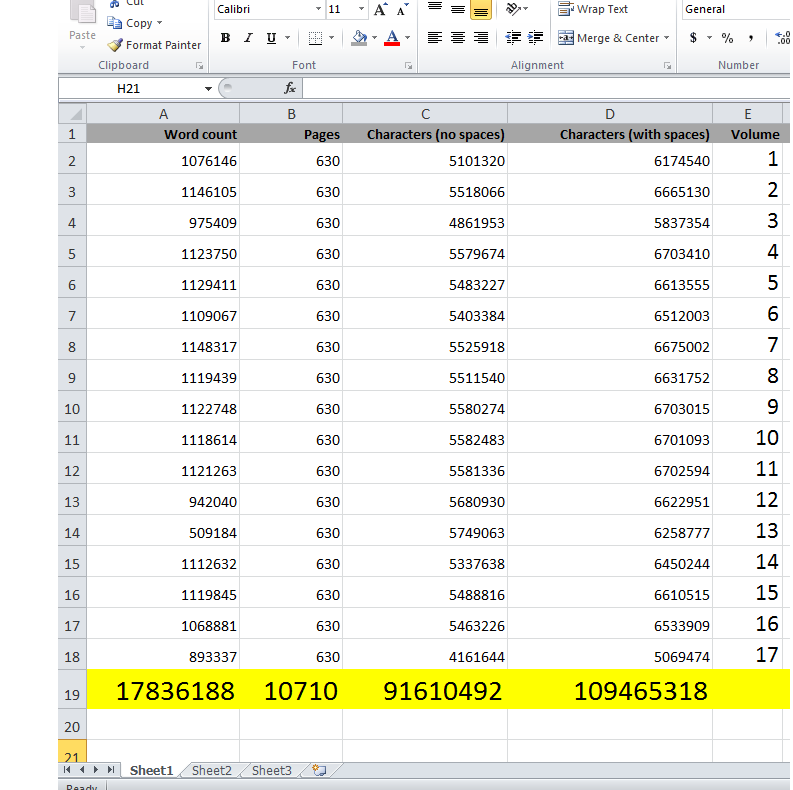 Page counts were measured for each of the 17 volumes using Microsoft Word (one volume per Word document). The final count was produced in an Excel spread sheet. For verification purposes, screen shots of the 17 Word documents and Excel summary are pasted below. 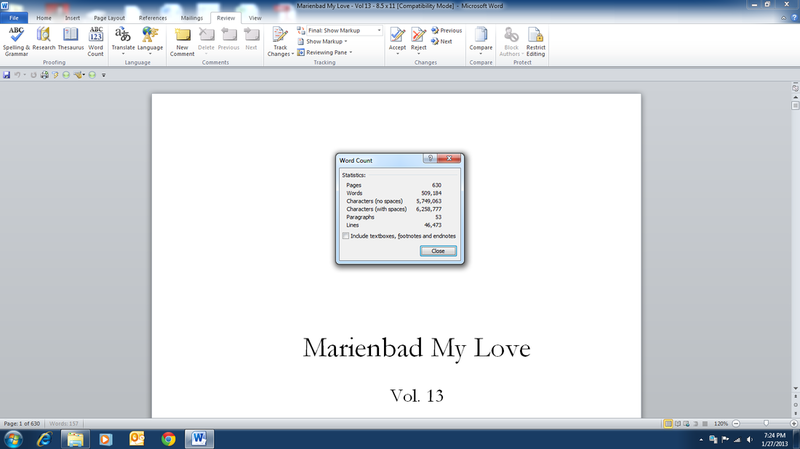 * the weight of the novel - "Marienbad My Love" is 65 pounds and 11.4 ounces. The weight was measured on a U.S. Postal Service scale. 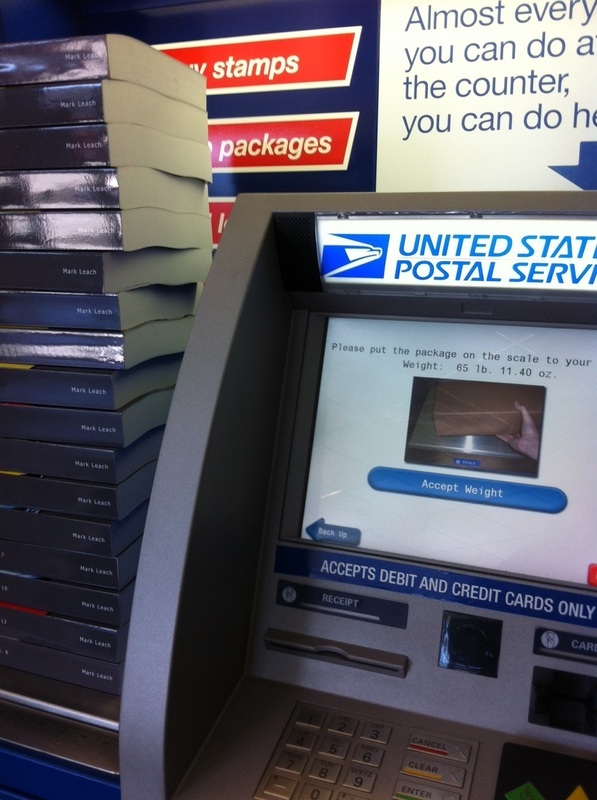 For verification purposes, a photo showing the 17 volumes sitting on the scale and the total weight indicated on the screen is pasted below.